2009 marked our 10th anniversary of professional sailing, many of them spent in remote places such as Alaska, Patagonia and the vast emptiness Southern Pacific.. That's why we decided to celebrate the occasion with a series of special cruises and expeditions, beginning with the adventure in the mythical island of South Georgia. The Sub-Antarctic island of South Georgia is "breathtaking beautiful and a sight on an early spring day not easily forgotten" (Niall Ranken 1946). It is long and narrow, shaped like a huge,curved, fractured and savaged whale bone, some 170 kilometres long and varying from 2 to 40 kilometres wide. 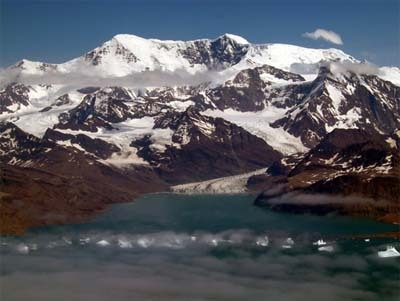 Two mountain ranges (Allardyce and Salvesen) provide its spine, rising to 2,934 metres at Mount Paget's peak (Eleven peaks exceed 2,000metres). Huge glaciers, ice caps and snowfields cover about 75% of the island in the austral summer (November to January); in winter (July to September) a snow blanket reaches the sea. The island then drops some 4,000 metres to the sea floor. South Georgia lies between 35.47' to 38.01' west and 53.58' to 54.53' south within the Polar Front being surrounded by the ice cold waters that flow up from Antarctica(South Georgia is at about the same latitude relative to the South Pole as the North of England is to the North Pole). The tip of South America, Tierra del Fuego is 2,150 kilometres to the west. The Falkland Islands are closer, but still 1,390 kilometres away to the west. 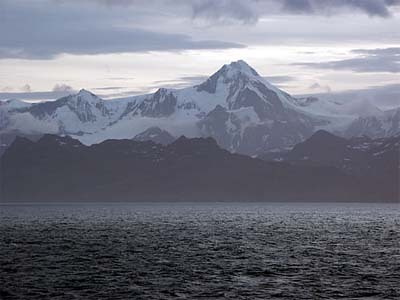 The mountain ranges and the precipitous southern coast shield the northern facing bays from the fierce prevailing winds and depressions that roar in from the Drake Passage to the west and Antarctica to the south. South Georgia and South Sandwich Islands (SGSSI) (further to the south-east) are a UK overseas territory. Continuous UK administration has been in place since 1908. At the height of the whaling period some 2,000 people lived on the island. Now there no permanent residents - but there are two British Antarctic Research Stations (Bird Island and King Edward Point), Government Officers and museum curators during the summer months. All travel has inherent risks, but travel to South Georgia carries a greater level of risk then to many, more traditional, destinations. There are no medical facilities for visitors. In an emergency, there is a possibility of accessing the support offered to visiting fishing vessels at King Edward Point. But this is not available elsewhere on the Island. There is no search and rescue, or other emergency service on the Island.